This week’s photo challenge is ‘Renewal’….this one was tough for me as I always want to resort to the sunset or something simple…I have loads of those photos! After quite a bit of thought, I decided to focus on what renews my spirit. For me personally it is anything and everything outdoors, primarily, any activity that can be done in or near the mountains. 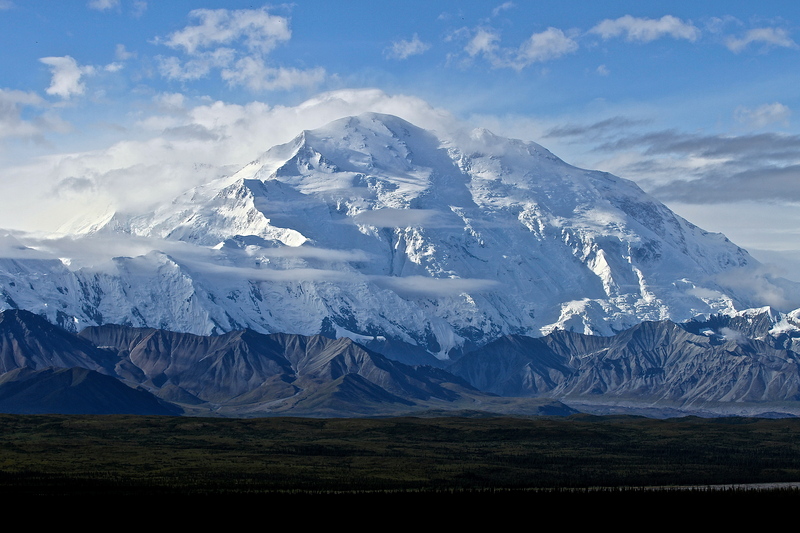 The photo below was taken on a backpacking trip in Denali last summer – this is Mt. McKinley. Many people travel to Alaska to see this majestic mountain and leave disappointed because of bad weather or cloud cover – we got lucky that day! Yes!! For whatever reason, any time I am in or near the mountains, everything just seems to reset inside of me. good stuff. Fortunate to be in Colorado for that very reason ;-). So beautiful…would love to make it out to Colorado one of these days. yes you should!! This was actually Alaska which is truly spectacular as well! Thanks – it is 10x more amazing in person!! Thank you – we were sooo lucky that day. It had been raining for the entire week before we got there ;-). Wow – that’s a perfect shot! Thanks! I must have taken 100 pictures of this mountain that day! Renewed, and revealed! Fantastic shot. Thanks Jeni! Appreciate you stopping by!! wonderful picture! I’m amongst the ones who often arrives when the cloud is in and has left when the cloud lifts up… So glad to know some people are luckier and can get such great shot! Cheers! Awesome for Renewal! That is such a bummer! we met people that day who had been several times before and never seen it! They were happy campers too! I bet! I’ve been lucky some times too, but a friend of mine thinks I’m jinxed! ha! 😉 I plan a series of photos in the fog… pretty sure very few people will have the same shots! ha! Would love to see them! Alaska’s on the bucket list! It is fabulous! will get some Denali backpacking posts out on the Life Bus in case that is something you are interested in! Outdoors renews me EVERY time but I have never seen Mt. McKinley! Thanks for showing me the world!! Beautiful shot! Thank you! love a kindred spirit in this department!